Does the Nikon Z7’s sensor have a banding problem? It certainly looks like it, but just how serious is it? 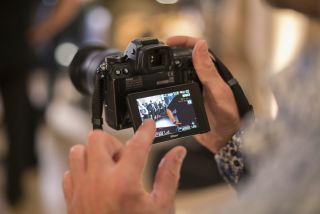 Reports are surfacing that Nikon’s stellar full-frame mirrorless camera, the Nikon Z7, is showing some unwanted image artefacts in very dark areas of its pictures. These show up as faint horizontal stripes under magnification, but only under very specific conditions. These stripes appear when raw files have their exposure increased by 4EV (4 stops) or more. That sounds like an extreme adjustment to make to any image, but it’s not uncommon to apply local adjustments of this size to bring out very dark shadow detail in raw files, and it’s likely to be a concern to photographers who carry out very heavy HDR-style manipulation. It was something DPReview found in its tests. We have carried out our own tests, in our Nikon Z7 review, on a large number of raw files shot with the Z7 and we can repeat the issue but only under very specific circumstances: the faint striping effects appears only in areas of even tone, and even then they are only especially prominent in areas of neutral grey - as you can see in the image below. The tests that highlighted this issue were carried out using Adobe Camera Raw, which is most photographers’ default raw processing tool, but which can introduce foibles of its own. So we examined the same images using Nikon’s own Capture NX-D software to find the striping is sometimes still visible, sometimes much reduced and sometimes not visible at all. It’s worth stressing that this striping effect is only visible under fairly extreme raw processing of a sort many photographers might seldom use. However, it doesn’t appear to affect the Nikon D850 DSLR, leading to the suspicion that it’s connected with the use of phase detection autofocus pixels on the Z7’s sensor. We have asked Nikon for a comment. Nikon Z7 and Z6 – what was Nikon's thinking, and how will the Z system evolve?